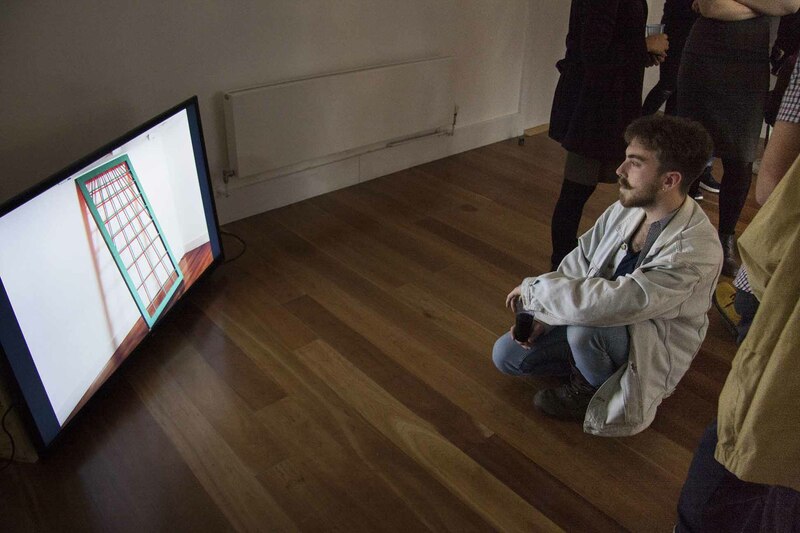 Our article writer Daisy Leigh-Phippard visits 3rd Year Fine Arts Exhibition ‘467 Characters Long’. 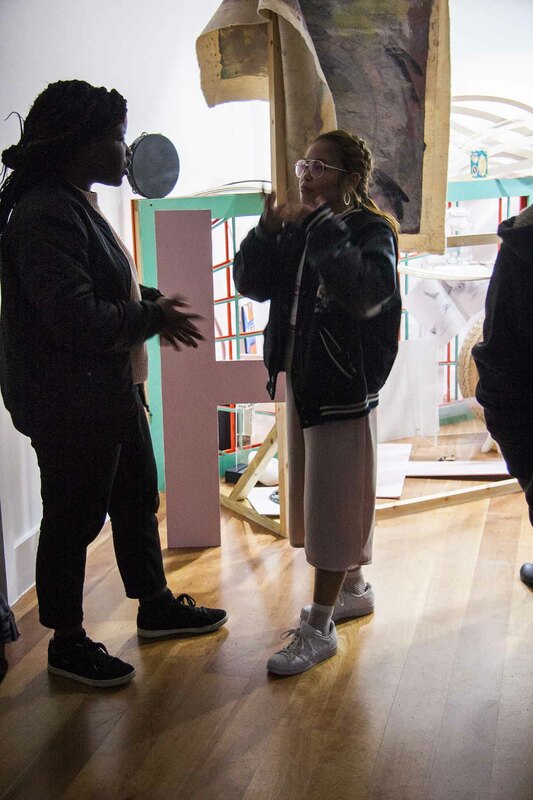 As part of their 3rd Year Elective, a group of Fine Art students have taken over the BUMF Gallery to bring us an exploration of collaborative artwork. The striking and complex installation focuses on ways of curating a space collaboratively, and on how the context of a space can influence the work and the way the audience engage with it. Suffice to say, the exhibition definitely shows how a shift in presentation can change the way you read a piece of work. 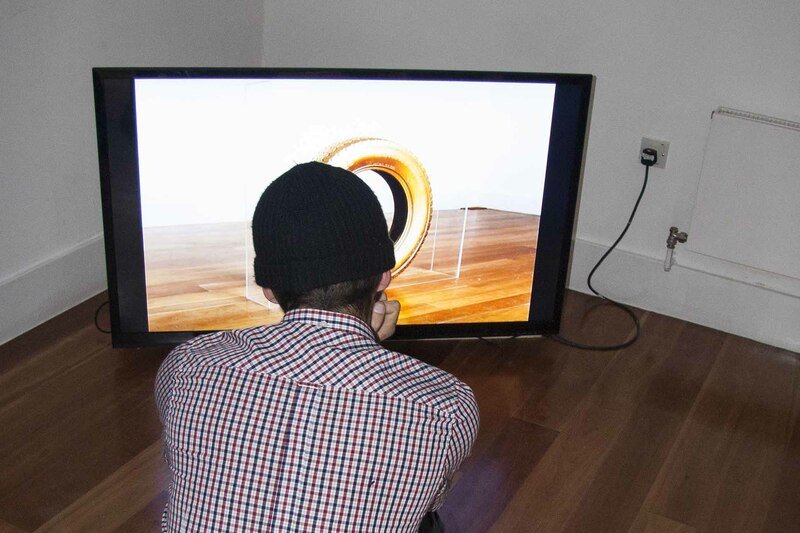 When you first walk into the BUMF Gallery, you see a television screen positioned in the corner of the room flicking through photographs of the artists’ work. Designed to immediately absorb viewers in, the monitor shows how each student envisioned their original pieces of art independently. As you move in further, you are then introduced to the sculpture-like installation that holds all of the artwork in its collaborative form. 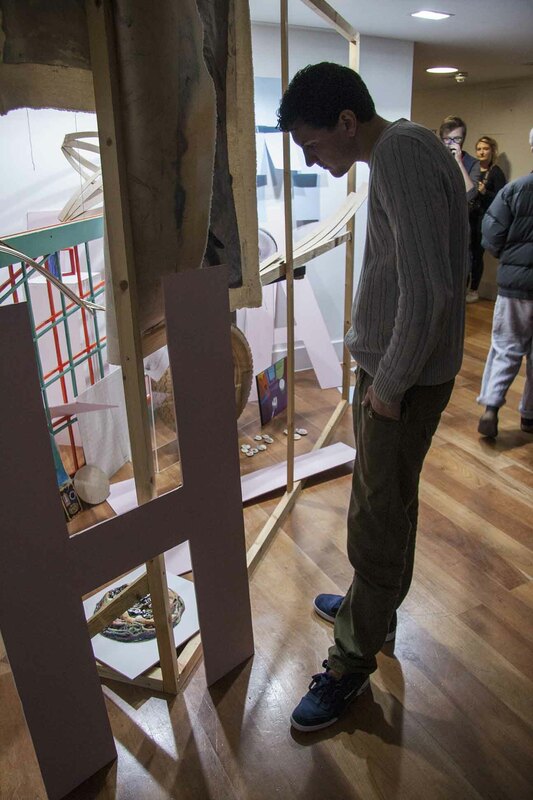 Speaking to the students involved, the inspiration began with the idea of showcasing each piece of work on a wall, but developed into the creatively envisioned structure that’s there now. They were playing with the idea of creating the perfect image on the monitor, and then shoving it aside to make something new. What struck me immediately was the fact that from every angle, the installation was different. You’d be walking around it and suddenly spot another little piece of artwork hidden in the gap between two others that you couldn’t see from one end. The singular works on the screen are very different from the collaborative result, and we’re left with a fascinating mix of styles and shape unique to each artist in a myriad of colour and objects, traditional art and the everyday. The combined imagery is striking: painted fabric draped over the skeleton structure of a wall; huge scattered letters on the floor and walls that were once whole; a collection of seashells holding hair slides and sewing needles shown together on the screen, but separated in the final piece. Though each artist created their piece on its own, the use of negative space in the way certain works peek out through the gaps left by another draw the whole collection into an ordered chaos. It almost feels like a part of the exhibit to watch the crowd move between surveying the sculpture and examining the original works on the monitor. And almost like a treasure hunt we went back and forth, having been introduced to new pieces on the screen and wanting to find their alternative context in the installation. 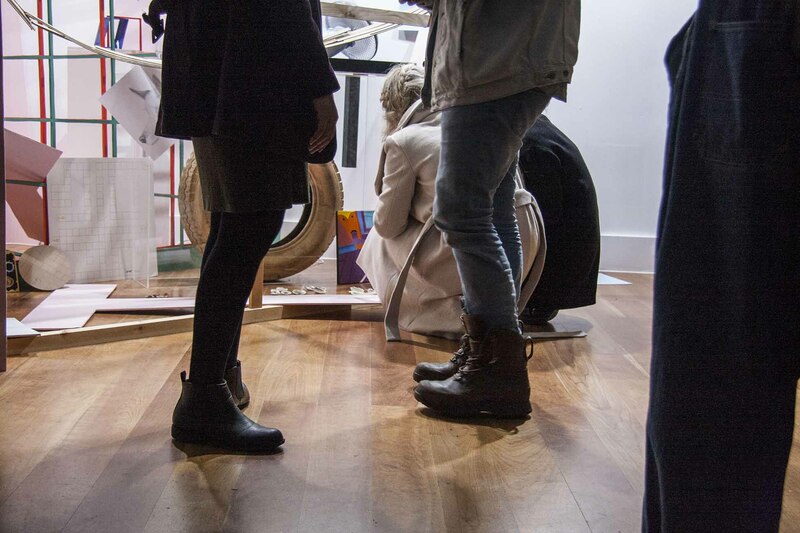 People lean into the gaps to see a new angle or discover another half-hidden piece of art. You barely want to distinguish each students’ individual work; the merging of their creative minds in such a small space creates something new entirely. The exhibition does a stunning job of engaging its audience through each piece of art separately, and then encouraging us to reevaluate how we understand each work when it is all brought together in the final collaboration.